In search, relevance is about how closely the search results that are returned match the user’s intent– or as outlined in About intent, recall, relevance and precision of search solutions – relevant results will help you achieve the goals that made you perform the search in the first place. It is therefore quite important that you don’t need to navigate through dozens of pages of search results and that you get the most relevant results listed on the top of your search results. 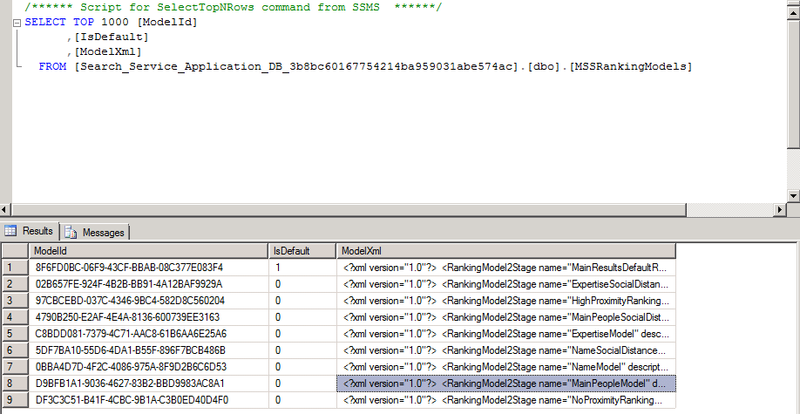 SharePoint 2010 search has standard 9 different relevancy ranking models defined, from which two are used by default. To get an overview of the different ranking models which are registered you can use the Get-SPEnterpriseSearchRankingModel PowerShell cmdlet. Get-SPEnterpriseSearchRankingModel -SearchApplication "Search Service Application"
After running this command you will get an overview of the different available ranking models. But unfortunately this XML returned seemed to be empty on my SharePoint 2010 environment – which seems to be behavior by design as explained in this blog post Accessing rank models in SharePoint 2010. 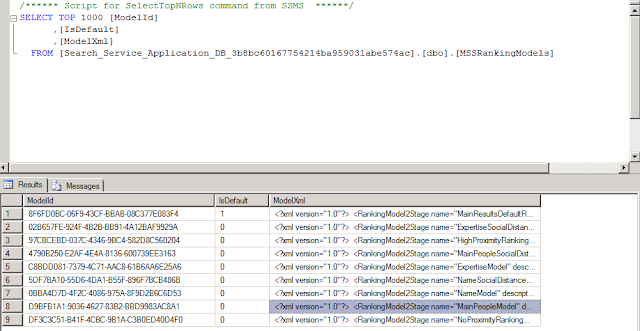 But luckily you can also open the MSSRankingModels table in the Search Service Application database and take a look at the XML which is stored in the database. You see a number of managed search properties which are being used – these actually map onto the following crawled properties. So you will probably notice that the People search will not take your own custom created user profile properties into account when doing a search for people. You will also notice that the user profile properties skills and interests are assigned the same weight from a relevance perspective since they both map onto the RankingWeightLow property. It is however also possible to create your own ranking model based on the Ranking Model Schema definition (MSDN). But Microsoft will only allow you to customize certain parts of the search engine ranking algorithm (For SharePoint 2013 there is a lot more in depth documentation of the ranking models – check out Customizing ranking models to improve relevance in SharePoint 2013 ). 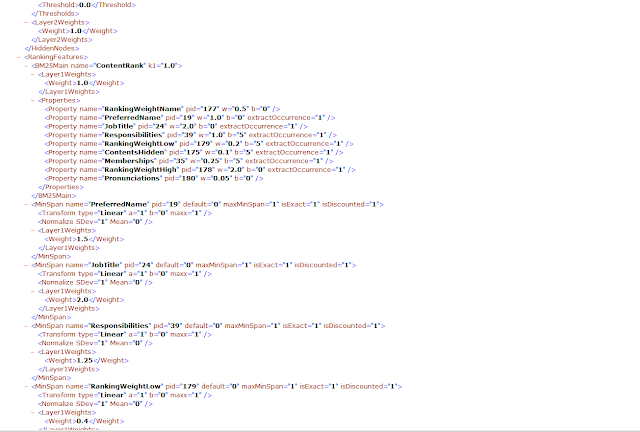 In the next example XML schema I added my own custom managed property Certifications and kept all of the other properties and weights for the different querydependent features. Modifying the length normalization setting applies only to properties that contain text. For example, consider a scenario where relevance is calculated for two content items containing the query term within the body of the content item, within a book, and within a document containing only a short paragraph. The book is likely to contain more instances of the query term, so it might receive a higher rank value, even if the shorter document is just as relevant to the user's search. The length normalization setting addresses this issue, providing consistency in ranking calculations for text properties, regardless of the amount of text within that property. Next we will need to import our XML with the custom ranking model – you do this using the New-SPEnterpriseSearchRankingModel cmdlet. The easiest way to test your new custom ranking model is by using a querystring parameter rm – like this http://jopx/searchcenter/peopleresults.aspx?k=yammer&rm=[ID of your ranking model]. In the screenshot below the People search will also take into account my own custom profile property - Certifications allowing me to search on them. To use this new model in production, you can export the Core Results webpart, modify the RankingModel parameter and reimport the web part. Hi, great post. However I receive the error that paramter owner cannot be found. 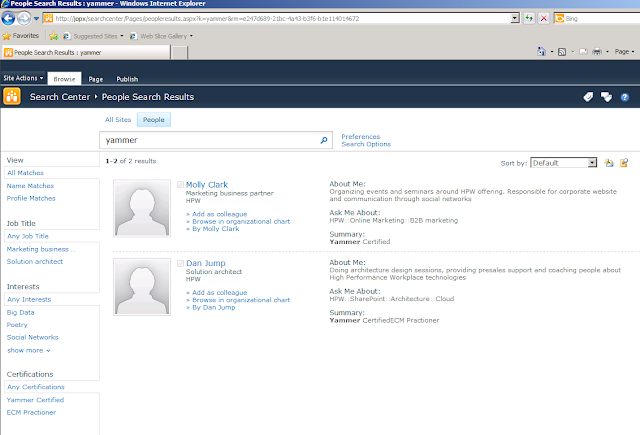 This is Sharepoint 2010 SP1. 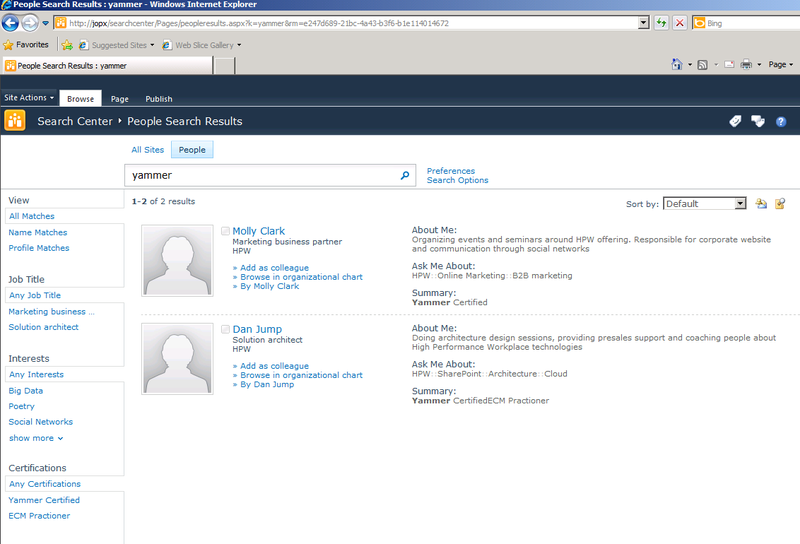 Get-SPEnterpriseSearchRankingModel : A parameter cannot be found that matches parameter name 'Owner'. Do I need SP2 or is this refering to SP2013 ?